Climate change is having a major impact on Britain's coast, the seas around the coast, and the life in those seas, a government-sponsored report concludes. The Marine Climate Change Impacts Partnership (MCCIP) says seas are becoming more violent, causing coastal erosion and a higher risk of flooding. 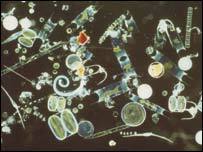 Higher CO2 levels in the atmosphere are making oceans warmer and more acidic, affecting plankton, fish and birds. 2006 was the second warmest year in coastal waters since records began. "Our seas play a vital role in regulating our climate and are a lifeline for the communities that live around them," said Scotland's Environment Secretary Richard Lochhead. "Our marine life is now having to cope with these as well as other pressures, and is beginning to suffer as a result." 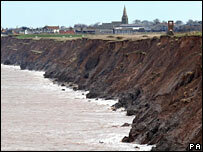 The increasing choppiness of coastal waters means that 17% of Britain's coastline is being eroded. England is feeling the impact most, with 30% of its coast affected, compared to 23% for Wales and 12% in Scotland. "An increasing trend in extreme water levels has been observed," the report concludes, which is most likely to be caused by the rise in average sea level, and which brings an increased risk of flooding. MCCIP expects rising sea levels and an increase in storm intensity to spread the extent of erosion in future. Warmer waters are changing the distribution of plankton, the tiny marine organisms that sit at or near the base of many marine food chains. In the North Sea, the previously dominant cold water species Calanus finmarchicus has declined by 70% since the 1960s. The MCCIP report says these changes "have led to reduced availability of prey fish for some seabirds, which has been strongly linked to recent poor breeding success and reduced survival rates." One bird affected is the black-legged kittiwake, whose "poor breeding success and reduced survival in recent years have been strongly linked to warmer winters and changes to their fish prey populations". The ability of wildlife to withstand these trends is reduced, the report concludes, by over-fishing.